Every decade has its share of toy-related consumer crazes – Pogs, Furbies, and Tamagotchis come to mind. But none were bigger and brasher than the Beanie Babies craze of the 1990s – a speculative “toy as investment” frenzy that saw the plush dolls from Ty Inc. transformed from children’s playthings into a form of currency. 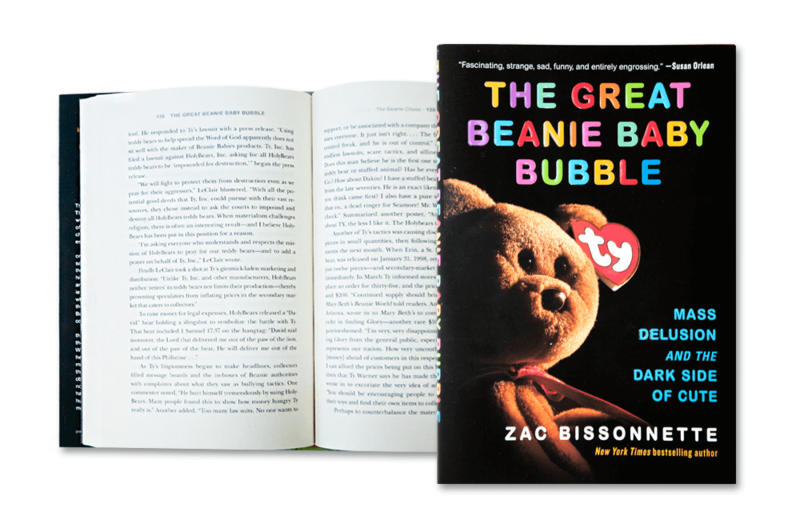 Beanie Baby-mania is front-and-center in the book, The Great Beanie Baby Bubble: Mass Delusion and the Dark Side of Cute. Over the course of 272 pages, author Zac Bissonnette unpacks the fascinating back story behind the fleeting fad and profiles some of the personalities that were enveloped by it. Nonplussed, Bissonnette spent the next two years doing just that. He interviewed a multitude of people in and out of the toy industry, from current and former Ty employees and executives to his sister, girlfriends, collectors and dealers. The product of his extensive research is quite the non-fiction page turner. I had trouble putting it down! Bissonnette’s in-depth characterization of Ty Warner paints him as a dynamic, obsessive, and ultimately polarizing figure. Warner micro-managed the product and sale of Beanie Babies down to the minutest detail. For example, he didn’t distribute Beanie Babies to big box stores, refused most licensing deals, kept retail prices for the dolls at $5, and would routinely remove Beanie Babies from the market and replace them with “improved” versions. Ironically, his quest for perfection had an unintended side effect – driving up demand for his “retired” dolls. Being a shrewd salesman, Warner quickly parlayed this demand into a marketing ploy to drive further sales. Influences beyond Warner’s control were also at work. Bissonnette weaves in the stories of a small group of soccer moms (remember them?) in a suburb of Chicago who began collecting, categorizing, and evangelizing the dolls. Despite being summarily despised by Warner, this group of “early adopters” paved the way for the trading, speculation, self-published collectors guide, and magazines that listed current and projected Beanie Baby values. As Bissonnette recounts some of the bewildering personal anecdotes from various Beanie Baby “investors,” a common thread is revealed. Many of the collectors have absolutely no explanation for their antics. It is almost too easy to simply dismiss these actions as greed, and I found myself wishing that Bissonnette would have delved deeper into this pattern of behavior. The Beanie Baby fan base was also fueled by the rise of home internet usage, the World Wide Web, and eBay, where a huge secondary sales channel quickly grew with Beanie Babies accounting for 10% of eBay’s sales in 1998. Ty Inc. was also one of the first companies to have a corporate website and to use it as a tool for consumer engagement. Bissonnette refers to this combination as an example of one of the first viral internet phenomena. The inevitable Beanie Baby crash came quickly. The inflated values of the dolls plummeted, leaving a string of suddenly worthless collections in its wake. Bissonnette recounts the downward spiral, quickly moving past the stories of jilted investors to return his focus back to Ty Warner and Ty Inc. Despite his advancing age and lingering tax evasion issues, Warner remains involved in the toy industry, and his company remains the largest manufacturer of plush dolls in the world. While no longer publishing, GamePro magazine was one of the preeminent gaming magazines of its time. Published from 1989-2011, the magazine featured editorials, product reviews, and even its own superhero named GamePro. While Knucklebones is no longer published, there was a time between 2005 and 2007 it was a valued resource for news and reviews of card and board games.